It seems like every day there is a new microaggression against modern day feminism. Whether it's Donald Trump enforcing his patriarchal rage against his woman opponent running for president of the United States, to male audiences feeling "left out" over the popularity of feminist narratives on TV shows like Insecure, feminism has--for so many-- become synonymous with emasculation. Baffling as that concept may be, it's not a new one. Even the fictional TV heroine Mary Tyler Moore had to put up with eyeroll-worthy office politics in the 1970s. 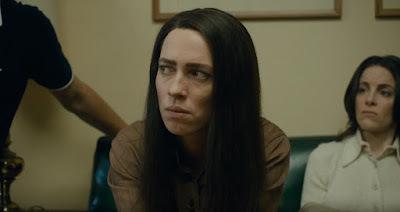 And during that same era, Christine Chubbuck encountered the same challenges in the workplace, as portrayed so viscerally and tragically in the new movie CHRISTINE. Starring Rebecca Hall, CHRISTINE tells the real life story of an ambitious 1970s Florida TV anchor whose brilliance and determination should have catapulted her up the corporate ladder, but instead planted her in a menial level, consistently overlooked by her more affable yet less qualified colleagues. She was full of ideas at the office, while simultaneously wrestling with the need to be successful and accepted not just as a woman but as a valuable member of the team. And when she came to the realization that neither hope would come to fruition, it was tragically more than she was willing to bear. That is the foundation to understanding the character study that is ultimately CHRISTINE. Professionally outspoken yet socially awkward, Christine wore her internal struggles on her sleeve, unable to hide past issues with mental and emotional stability, which director Antonio Campos inexplicably decided to reserve as a pre-narrative element. This vital character layer is instead offhandedly revealed in an argument between Christine and her mother (J. Smith-Cameron), in which Christine is having a meltdown exacerbated by the overwhelming frustration she is feeling at work. In fact, much of what we discover about Christine leading up to her infamous on-camera suicide is through Hall's extraordinary performance, despite the actress saying she knew very little about the real Christine, having only seen a 15-minute interview clip. 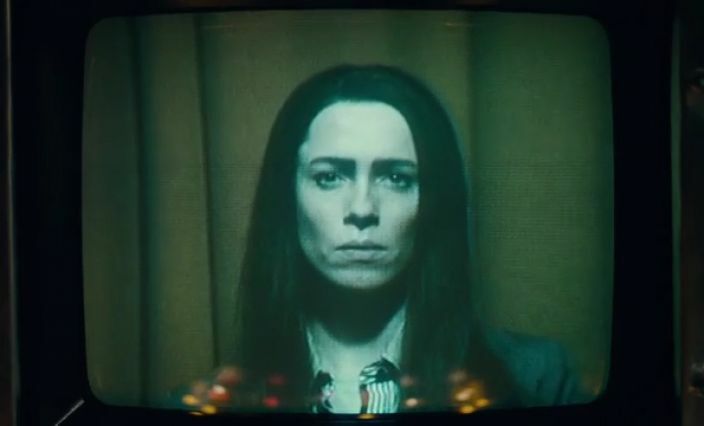 Whether she's creating the character, or taking it from what little she was able to capture from real footage or conversations with those who were close to Christine, Hall authenticates a distinct crouch, strict eyebrows, and a frog-like voice that convinces you right from the beginning. While there are moments of humor in the film, mostly dark wit through the gaze of Christine, always too smart for others' comfort, which particularly was seen as a threat to her male counterparts. Her boss Michael (Tracy Letts) even goes so far as to tell her that the "problem" with feminism "is that it basically authorizes yourself to be louder than the other guy." (The fact that he says "guy" here and not "woman" or "person" is not lost on the audience). There is something to be said about two male storytellers, Campos, with screenwriter Craig Shilowich, constructing a narrative that is so inherently feminist yet seeped in vulnerability that always feels genuine. Though the ending is a bit heavy-handed, it's a haunting reflection on the hopefulness of feminism for the 1970s working woman, which is also uncomfortably effective. And while Christine's death is a part of the conclusion of the narrative, it doesn't define it. Yet, there's a darkness to CHRISTINE, a morbidity that tints its subtle humor and shadows its main character's every best intention. It's a complicated portrayal of a woman who we may never quite understand though she remains a fascinating person to explore. Amazing review! I'm looking forward to this. Great review! Christine reminds me of a lot of Network with a female narrative, violence of the media, etc. I'm so looking forward to this!! Maybe don't put spoilers in the first line of reviews in case not everyone knows the conclusion. Dear reviewer (and hear, hear, Jared Scotton): Thanks so much for ruining this movie for me and countless others by spoiling the ending. I read reviews of this movie, as I always do before watching any movie, but I made a point of not reading anything about the events and people involved before watching the movie specifically because I didn't want to know anything that would spoil any part of the story for me. With a few thoughtless keystrokes, you completely ruined what would have been a dramatic and shocking ending for me and others who read your review on Rotten Tomatoes. Just because a movie deals with true events it doesn't mean that the commonsense and standard rules of not including spoilers (unless you add a spoiler alert) in a review don't apply. I would respectfully request that you study 101 review etiquette before writing further reviews (read: spoilers are a no-no unless you warn people first!) and also ask you to edit or remove your review of this movie from Rotten Tomatoes so you don't spoil the movie for other viewers as you did for me. Saw this movie before reading this review. Love the movie, and love the review. While I personally don't believe that knowing a story's end ruins the experience (hell, we know the end of Romeo and Juliet before seeing it), it's a belief that's not widely shared. I'd recommend giving warnings in the future, but at the end of the day, do what you want.